How do I use the People page in an account? You can view all users in your account in the People page. You can view and filter users by course role and search for users individually. You can also sort search result columns in ascending or descending order. For all users, you can manage and create account groups, manage profile pictures, and view user profiles. In Account Navigation, click the People link. If you have organized courses in your account by sub-accounts and those courses include enrollments, click the Sub-Accounts link to locate and open the sub-account, then click the sub-account's People link. The People page displays all the users in the account. The page is designed with global settings at the top of the page  followed by the generated user data . 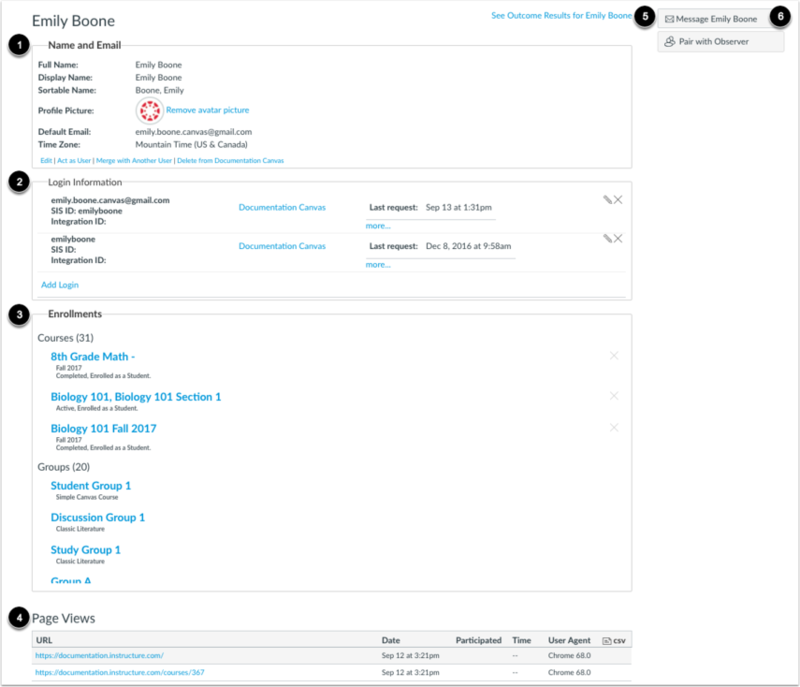 All fields are responsive to the width of the browser, which can be adjusted as needed to display course data. Global settings include searching and filtering by user data. Filters and search fields are updated dynamically. 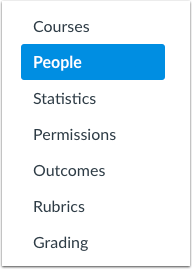 The People page displays users by all course roles by default. To filter users by individual role, select the Roles menu . To search for a specific user, type part of the user's name or their full name in the search field . Note: The Roles menu does not include admin roles. To add a user to the account, click the Add People button . The Add People button only displays if you have permission to manage enrollments. To manage account-level user options, click the Options menu . 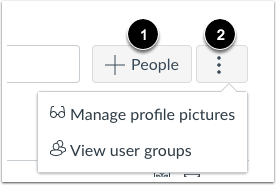 If you have appropriate permissions, you can manage profile pictures and view user groups. The People page paginates filter and search results in sets of 15 users and are ordered alphabetically by last name. Each paginated page displays in a table format but columns are responsive according to the widest column for that page. Results display the name of the user , email address , SIS ID (if applicable) , and last login date and time . A login on the current date displays the time only. Each column heading can be sorted in ascending or descending order. Note: Viewing user email addresses is an account permission. Depending on your permissions, you may not be able to view a user's email address. To open a user's profile, click the name of the user . For quick access to user data, you can act as the user , send a message from the Conversations Inbox , and edit user details . Name and Email : shows the user's full name, display name, sortable name, profile picture, default email, and time zone. As an admin, you can edit the user's profile details, act as the user, merge the user's account, and delete the user from the account. Login information : shows the user's login information, SIS ID (if any), account, and last request. If permitted, you can manually manage login information to edit the login information or add an additional login and password. 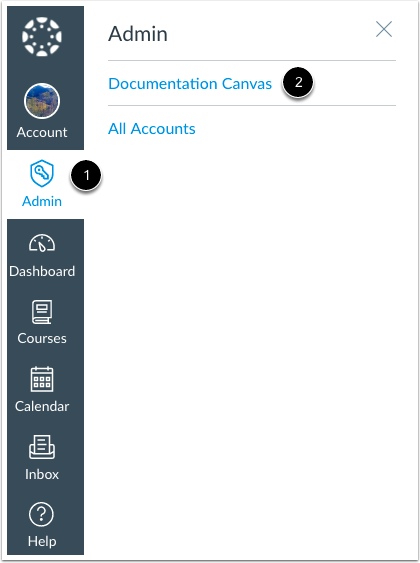 Enrollments : shows the enrollments for the user grouped by courses and/or accounts (if the user is also an admin). Page Views : shows the most recent page views for the user. When available, you can also view outcome results for the user  and send a message to the user . 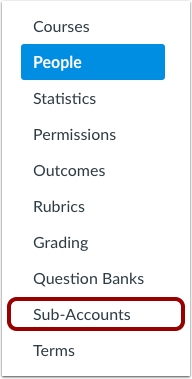 Previous Topic:How do I view the outcomes results report for an individual student in an account? Next Topic:How do I add users to an account? Table of Contents > People > How do I use the People page in an account?